The Puppy Mama App is the easiest way to find cute spots and schedule puppy play dates, “yappy hours” and brunches with friends. Puppy Mama is a new community app that connects women and their dogs with pet-friendly travel, services, places and activities. It is live on Kickstarter and raising funds to bring the project to life. Currently, traveling with dogs is tough and in the United States, only 8% of workplaces and less than 2% of restaurants are dog-friendly. 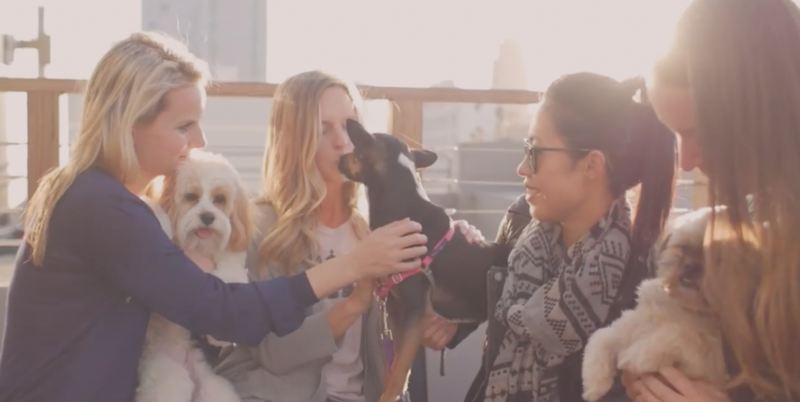 Puppy Mama is hoping to change that by leveraging technology to help women connect with one another and share information that will remove the friction in finding pet-friendly travel, places, and social events. For example, the app will make it easy to find cute spots and schedule puppy play dates, “yappy hours” and brunches with friends. When community members find a location they love, they can easily add a review and 5-Paw rating so other community members know they are welcome, and that their business is valued. The app will also make it easy to message, share photos, and inspirational stories of how women’s furry best friends have brought joy to their lives. Puppy Mama’s mission to create a more dog-friendly world. Piasta also feels that many busy, on-the-go women professionals also struggle with pet-friendly business travel. “We talked to many women who experience a lot of friction with business travel. Let’s say one of our members has a last minute business trip to Charlotte. We want to make it easy for her to quickly search, find, and book that pet-friendly hotel and pick an airline that is going to welcome and make the travel experience easy for them and their dog.” Piasta also plans to make it easy for these women to connect with and get together with other puppy mamas when they are traveling with their dogs in other cities. Before founding Puppy Mama, Inc., Theresa Piasta was a Vice President at JPMorgan, spending six total years in the Investment Bank and Sales & Trading businesses at two Wall Street banks. Prior to that she served as an Army Captain in a Field Artillery Brigade. During her 14-month Iraq deployment in 2008, Theresa led a large team to defend thousands of soldiers and contractors residing on Forward Operating Base (FOB) Delta near the Iranian border. She was awarded the Bronze Star Medal for her service. Theresa attended the Stanford Graduate School of Business Ignite program in 2016 and received a B.A. in Economics from Wellesley College in 2006. She also studied military science at Massachusetts Institute of Technology as a ROTC scholarship recipient and was a collegiate soccer player for two seasons during her time at Wellesley College. This entry was posted in New Pet Products and tagged Puppy Mama app, women who love their dogs on March 14, 2017 by Rebecca Symon.